SlideComet is a boutique design studio based in Singapore that specialises in Presentation Design. The two young founders, Eugene Cheng and Kaixin Koh, started it when they had just finished their education from Ngee Ann Polytechnic. 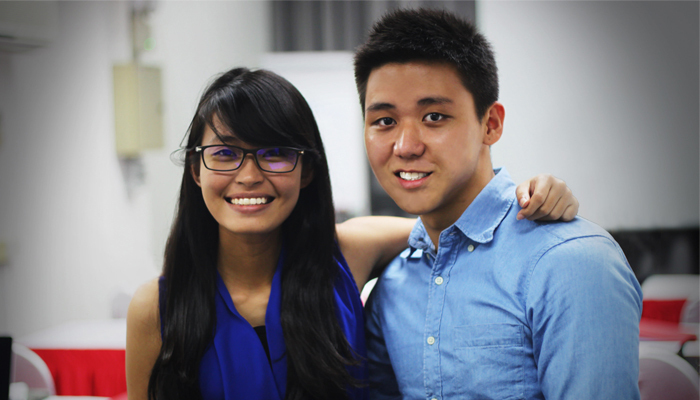 e27 had a chat with them to know what motivated them for this startup. According to Cheng, corporate presentations are starting to look homogeneous — filled with endless text and obtrusive images that fail to captivate audiences. SlideComet makes it their mission to evangelise companies about the importance of having visually appealing and functional slides, giving them an edge in high stakes client presentations. Both Cheng and Koh had picked up the skills to illustrate and design the slides during their free time in school holidays. While they were working together for group projects, they realised that they wanted to do something better and make their craft more impactful beyond the educational setting. After being given exposure to entrepreneurial events like E-challenge and Startup @ SG, they had the basic understanding of the startup ecosystem. For example, being able to draw up a business plan and pitch their ideas soundly. “Why are we doing this” is a question that the founders ask themselves often. They maintain that monetary gain cannot be the sole consideration in starting a startup. Starting SlideComet is partly due to their passion with presentations, and also because they believe in the vision or philosophy of the business, which is to change the way today’s presentations are. Founded only in 2013, SlideComet has already serviced prominent clients fromBTS, Singtel, Dentsu, SeedAsia and A*Star among others. When he first started out, Cheng went on SlideShare and started putting out his presentations for the world to view as his portfolio. Through the quality of his work, he got a few offers from Dentsu as a freelancer. Soon, he realised that what he was doing is merely the tip of the iceberg, and believed that people would pay for high quality slides. Currently, they are charging S$2400 (approx. US $1900) for their services. Cheng considers their startup a marketing communications company that deals specifically with slides. Their startup will help companies craft their message and ensure that their slides do justice to their ideas. In a high stakes presentation to close a sale, sometimes ideas are communicated very poorly, Cheng hopes to resolve this issue with SlideComet. Some examples of a high stakes presentation scenarios are an investor pitch or an employee goals presentation. The team is also working on a workshop training side to their business to help companies and individuals pitch more effectively. According to Cheng, better presentations are important because people expect them to be better. It is a form of visual storytelling. Some of the competitors in the market areBrightCarbon and StickySpy. However, Cheng says that BrightCarbon is for even more niche sales presentations only and StickySpy emphasises more on the workshop training aspect. They do not consider traditional marketing communications firms like advertising agencies their competitors because these firms consider presentations a side-line, with their main source of revenue being developing ad-campaigns for businesses. However, they are thinking of taking a leaf out of their books in terms of sub-contracting help from freelancers to do design collaterals. Currently, SlideComet’s business model is built solely on sales which they get through SlideShare, referrals from existing clients as well as networking. In terms of their future plans, Cheng and Koh intends to scale out of Singapore to Malaysia where they believe that they can secure additional leads for sales. They are also working on ways to systemise the business so that the founders can let the operations pilot itself and focus on the big picture. They can do this by hiring more talents and also through partnerships.